For all of the old-school death metal bands that seem to be coming out of the woodwork right now, it’s become clear that most of them veer toward one specific “school” of death metal: The angular, bizarrely dissonant strain of the Finns; the romping, darkly melodic buzzsaw tones of the Swedes; or the American school that is based more on its strong sense of rhythm with some technical finesse. 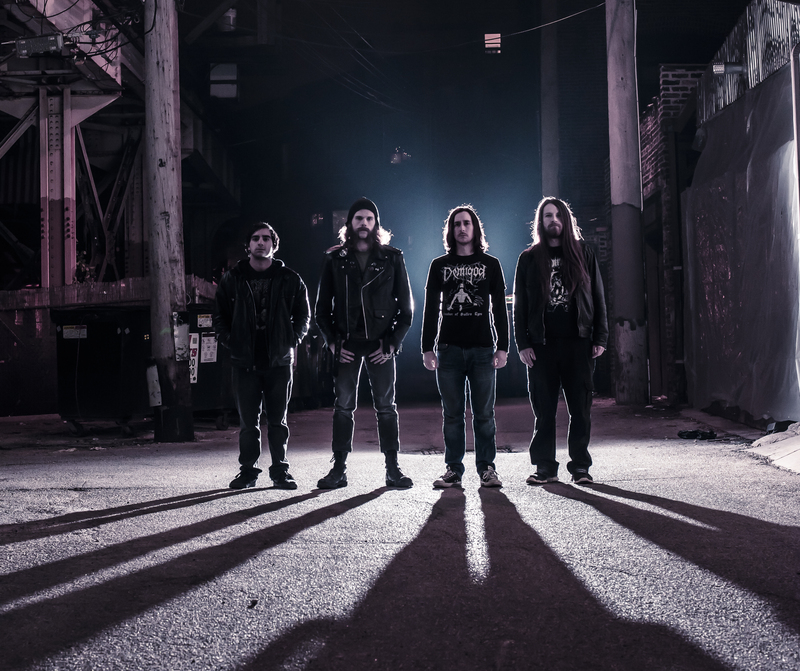 Chicago-based Nucleus, though, seem to draw from every aspect of old death metal on their debut Sentient while never getting bogged down in useless nostalgia. It does have its faults, but overall, Sentient is a very interesting melting pot of influences with enough of an original (read: sci-fi!) twist to certainly distinguish Nucleus from similar outfits. Over the course of nine tracks, Nucleus deftly integrate elements from the more angular, winding side of death metal as well as its more bruising, straightforward approach. While comparisons only go so far, imagine if the jumpy riffs of Death’s Human or Individual Thought Patterns played in that weird, labyrinthine Finnish way, but channeling those intergalactic vibes of Nocturnus’s The Key – Sentient is sort of like that. There are even some echoes of Voivod in the guitar work, particularly in the choice of notes and intervals and the drum work. Sentient can most definitely be labeled as “tech death,” but that tag functions a bit differently here than what most expect. As opposed to hyperspeed blasting and masturbatory solos, the technicality rests in the dizzying time signatures, rhythmic alterations, unconventional riffs and tension of consonance and dissonance all executed with precision. Nucleus’s focus on sci-fi concepts in the lyrics carries over to the music: Despite the clean, lush production and surprisingly organic tones – not to mention a wonderfully audible bass clang that recalls Atheist – the alien (ha!) atmosphere is frighteningly robotic and cold. It’s an album that takes a few listens before it starts to make sense, but it’s a laudable improvement over the band’s past few EPs. The true opener “Dosadi” has a set of riffs that skitter around the fretboard, and an excellent solo ups the intensity before a banging Obituary-esque groove carries the band to a barrage of change-on-a-dime shifts in beats and tempo. “Cube” erupts with blasting drums and mechanical, oddly-harmonized guitar work, while “Insurgent” relies more on its Morbid Angel-esque rhythms. Tracks like “Ancient” and “Extirpate,” however, bring an almost death-doom influence to the front and offer some of the album’s most straightforward songwriting without sacrificing the spacey, cold vibes of the remaining tracks and provide some reprieve in the album’s latter half. Closer “Starflyer” is by far the most ambitious and varied effort here, though, starting with a uneasy, spidery Demilich-styled melody and countermelody before spiraling descending arpeggios take the song to its dirgeful second half, book-ended by a flight-of-finger guitar section anchored in a mid-tempo stomp and interspersed blast beats. 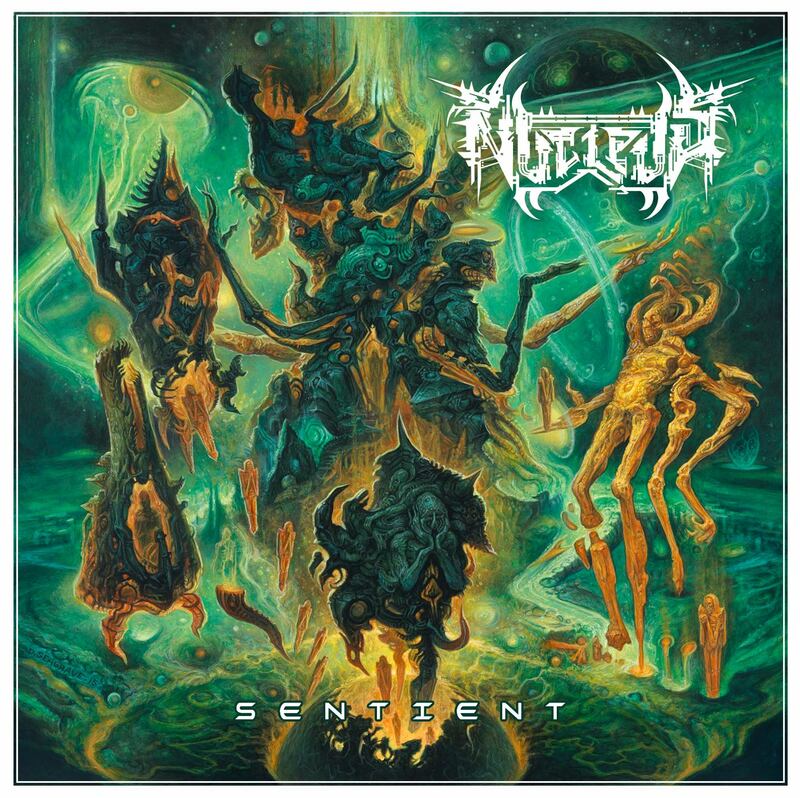 For those looking in variety in their death metal, Nucleus have you more than covered, but Sentient is still a staggeringly cohesive and focused album. As mentioned, Sentient is beautifully mixed and mastered for a modern death metal album – it forgoes the intentionally murky and cavernous sound of most modern death metal but isn’t processed to pieces as most tech death is wont to do. Thankfully, it’s not compressed within an inch of its life, leaving plenty of space for Nucleus to rip. Not surprisingly, the mastering was handled by Damian Herring of Horrendous, who has earned a reputation for having a penchant for preserving the natural dynamics of metal. But on that front of the general sound, my only nitpick is with the drumming: The drum parts, while impeccably played, and even fitting for the greater aims of Nucleus’s music, feel remarkably bare. There are moments with excellent, off-kilter fills and inventive transitions that weave around the riffs, but there also bits in songs like “Cantos” and the first section of “Swarm” where the beats seem stuck in a gear of intensity below what the rest of the band is playing. About a minute into “Insurgent” is the clearest example, as the band are roaring with a tempestuous riff pattern over top of a basic, four-on-the-floor rock beat that neuters that section’s momentum until the next change. That said, I commend Nucleus’s drummer for the amount of musical restraint in his playing and allowing the guitar work to shine through; too often in death metal, the bombastic drums are merely hiding the uninventive riffs, but that is certainly not the case with Nucleus (quite the opposite, clearly). Sentient is an admirable release and with the band growing in all the right ways, Nucleus could very well prove to be the new darlings of the death metal underground. Even with some of its small drawbacks, Sentient is absolutely worth giving your time to. Sentient will be released on 04.15.2016 via Unspeakable Axe Records and is available for pre-order digitally and on CD. For more information on Nucleus, visit their Facebook page.